Kristoff Barada N… Necktie… Neckturn… Nickel… It’s an “N” word, it’s definitely an “N” word! Kristoff… Barada… N… [coughs] [pause] Okay then… that’s it! Whoa I said the name you heard me! I am a cigar aficionado. I think I can but by the time I get to smoke them I forget. Two Stones and a Kristoff , well the band anyway. Back to cigars and beer. I opened up with the Stone Gotterdamnrung. 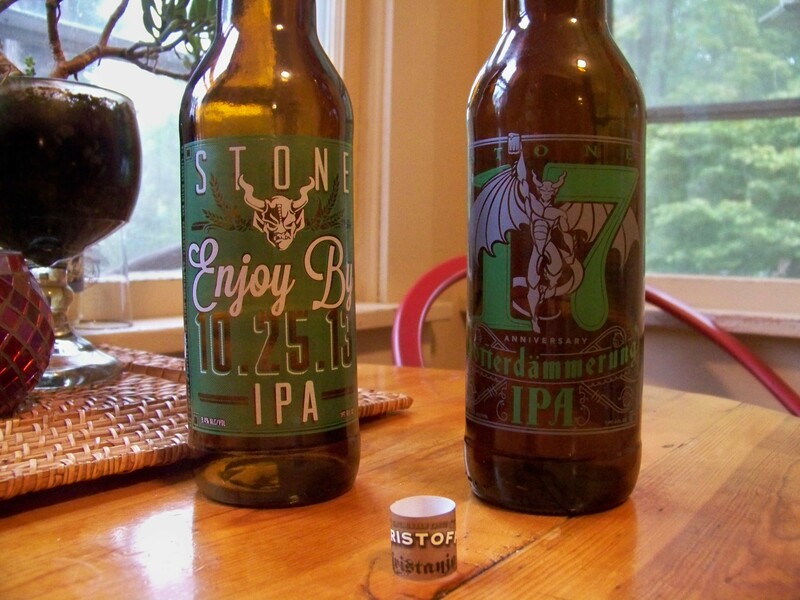 A very intense, like Stone would do anything less, IPA. 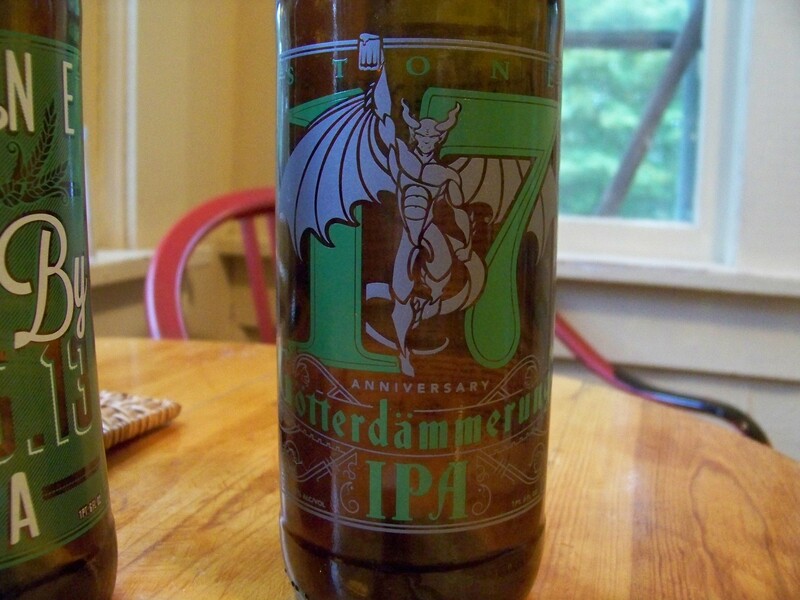 This is a 17th Anniversary IPA for them. For me it was a nice evening in with the wife. The beer had intense hop flavor but balanced by a maltiness with enough residual sweetness to even it all out. This is a heavier IPA not going the dry route that seems to be the thing lately. As I sipped away, we made the most out of a rare, both off, no running to do, and nobody home night. That’s right we took over the TV. What? Get your mind out of the gutter. We watched the premier episode of Brew Dogs on Esquire channel. Which paired well with my Stone beers. This show has a lot of potential, I hope it sticks around. Needless to say this beer was enjoyed down to the last drop. Unfortunately, like peace and quiet at home, this beer didn’t last forever. As the night went on my brother and niece came home. They are living with me temporarily while he builds his house you can check out that blog here. 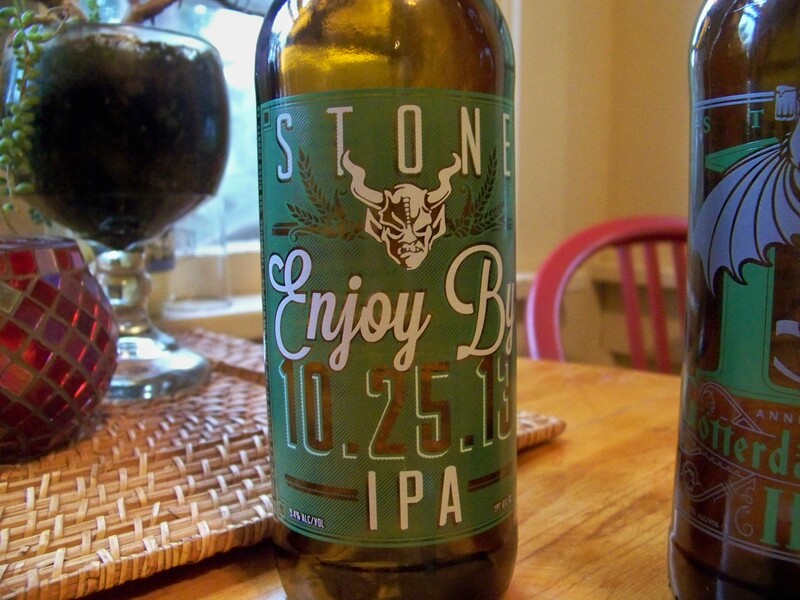 Cracking open the second Stone Brewing Co. beer another one of the Enjoy By series. This one was 10-25-13. Ok I made the cutoff on this one by 25 days. As with the last Enjoy By I had this one was dank, resinous, and strong hop flavors. I did like this one better due to less of an onion type flavor from the hops. I recommend these to any hop lover that wants to experience aromas and flavors that will confuse your senses. I had thrown on a Dungeons and Dragons movie that I had put on the DVR about a year ago. Needless to say the movie was background fodder as I sipped away on my Stone and took draws on my cigar now. The conversations ranged from deer hunting, to raising children, family drama, and future business attempt plans. The Kristoff drew well and did not nor could not compete with the Stone for attention on my palate. They worked well together and it is nice to have a beer that is more flavor dominate than the cigar. We all went to our separate corners of my house as the night wound down. These are the ways evenings should be spent with family enjoying each others company a good beer and a cigar. As I have mentioned before It isn’t just about the beer or cigar it’s about the setting, the ambiance. That’s why I write the way I do. I am not an experienced palate, beer or cigar taster. I can pick out some flavors and know what I like and don’t like. These things are subjective and most people except for the true beer/food/wine/whiskey/cigar geeks don’t just sit around and dissect every thing they put in their mouth. I hope I am getting across, in my writing what enjoying these finer things is really about, the experience. ← Mandatory Fun and Coffee Raspberry Stout.